Including video content warnings, programs, scripts and more. 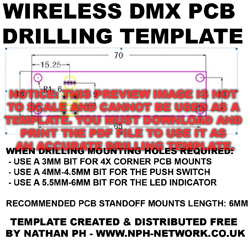 This is a driling template for the very common Chinese wireless DMX modules sold cheaply on eBay and Amazon. I created this in photoshop to speed up the mounting and installation process. The download is a PDF document that you simply print onto some A4 size paper or card. Then you can drill right through the template exactly where you want to mount your module. 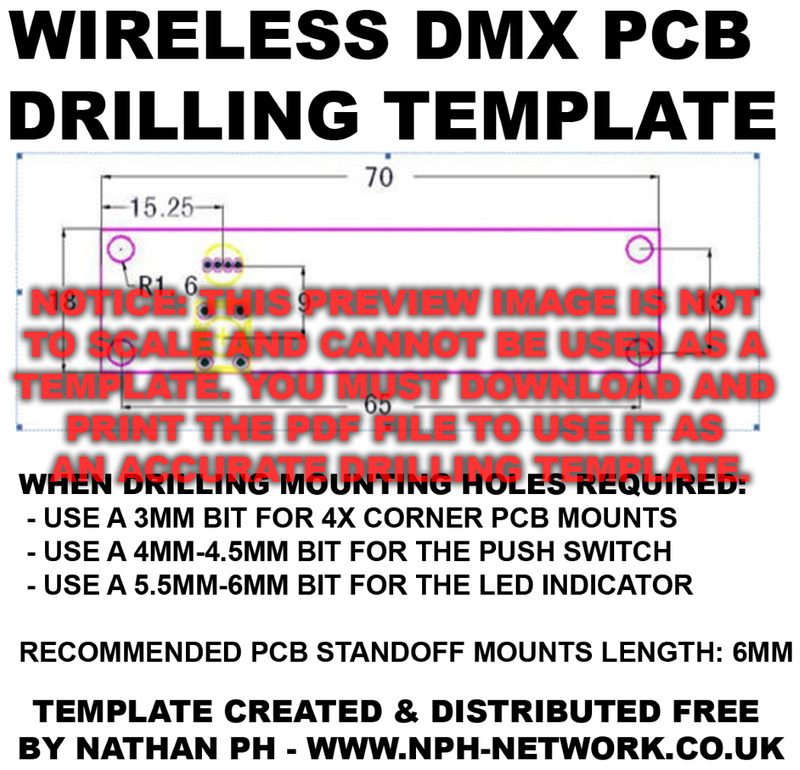 I have also added some suggested drill bit sizes and recommended PCB mounting standoff lengths below the template that work best from my experience. If you find it useful, consider donating. This is a pre-roll custom warning message I created myself in Sony Vegas Pro. The download is a 13 second long MP4 format file in 3840x2160 resolution at 60fps (4K UHD 2160p60). This is totally FREE TO USE for everyone! If you find it useful, consider donating. It displays text on the screen and reads out the following: "WARNING - THE FOLLOWING VIDEO CONTAINS EXPLICIT LANGUAGE WHICH MAY BE OFFENSIVE TO SOME VIEWERS AND / OR INAPPROPRIATE FOR CHILDREN. - THE CONTENT WITHIN THIS VIDEO IS INTENDED FOR MATURE AUDIENCES ONLY." It displays text on the screen and reads out the following: "WARNING - THE FOLLOWING VIDEO CONTAINS STRONG LANGUAGE WHICH MAY BE OFFENSIVE TO SOME VIEWERS AND / OR INAPPROPRIATE FOR CHILDREN. - THE CONTENT WITHIN THIS VIDEO IS INTENDED FOR MATURE AUDIENCES ONLY."